T.R. Ramachandran, is my grandfather. My mom's father. The correct English usage would be, he was my grandfather, since he died in 1990. But I don't care. He IS my grandfather and will always be even if he isn't here physically. Anyway, why am I writing about him? So, people will know that there existed on this earth a gentle and loving soul whom I miss dearly. I'm not trying to be flowery in my language. But I am sentimental, so I guess - bear with me. The picture you see here was taken in his earlier years. (I don't know when exactly). My grandfather was an old time actor, although my sister and I only knew of this. We didn't really get to see him in action as such although we heard a great many stories about his acting days from my mom, grandmother and aunts. It was absolutely wonderful listening to how they knew all the famous people from their time and how a whole host of actors and actresses had attended my parents wedding. Apparently my grandfather went against his father's wishes and ran off to become an actor! (Way to go thatha!). He followed his dreams and it made him successful. I hope to do the same. Anyway, the thatha (tamil word meaning grandfather) I remember is the one who stood up for my sister and me no matter what. He yelled at my mom and grandmother if they bothered us or yelled at us. :) He was a simple man, with simple needs and lots of love which he bestowed upon his grandchildren. He was a trusting soul and naive in many ways, especially when dealing with certain types of people (and I do mean the unsavoury kind). When I hear of how people have taken advantage of him it makes me absolutely furious with the world. He was a comedian, both in profession and in real life and he was tons of fun to be around. Varsha and I cannot recollect a single moment when we might have been angry at him. And that's saying a lot. :) He gave us advice, let us be kids, and protected us from whatever he could. He carried us when we were babies, sang lullabies to us and was proud to show us off to the world. He loved his vetralai ( betal leaf with toppings) and I have a vague recollection of having watched in fascination as he prepared his vetralais after a meal. He didn't swear, he didn't smoke and he lived life as best as he could. Sadly, he passed away in 1990 after an unsuccessful open-heart surgery. It was the worst day of my life. I didn't even know till we got to my aunt's house in Los Angeles, that he had passed away. My cousins, my aunts, my mom, my sister, my uncles, my great-grandmother and my grandmother were there and we were all completely lost. Thatha had not wanted the surgery, but one of my aunt's convinced him that it would be for the best, esp. since he had had two heart attacks earlier. I know that it is one of her deepest regrets now. My great-grandmother went into a state of shock, which she never recovered from. And I don't think I've moved on from it either. I do know that after that, I have never been able to cry for any real-life tragedy. I can cry at movies and I can cry when I read books, but I can't cry for a living being. Anyway, I can analyze myself later on. I wish people had a chance to meet him because he had the ability to make you believe in yourself and to make you smile. And that's a huge thing these days. You can tell how a person was by how he is remembered. A few years ago, I had been to Palaghat (18 villages in Kerala). I was walking down a street with an aunt and it being such a small village (some of the villages are only a street long, I kid you not), my aunt knew most people there. She went into someone's house to use their phone and she started talking to the people and she mentioned that I was T.R.Ramachandran's pethi (tamil word meaning granddaughter). Immediately, the owners of the house (a husband and wife who were getting on in their years) sat and spoke with me at length about how they miss his movies and you don't find class act comedians like him anymore. It made me so proud! They were so happy to have me in their house just because I was T.R.Ramachandran's grand daughter. They even invited us to lunch but we had to decline at that moment. Almost anywhere in Palaghat, when my aunt mentioned to whom I was related, someone had something very kind to say about my grandfather. They only knew him from his movies, but they had loved his work. It was wonderful being there. I haven't seen all my grandfather's movies. I hope to. But my favourite, of the ones I've seen, is 'Sathumirandal'. I feel it portrays him as the person we knew him to be in real life. Anyway, I just had to write about T.R.Ramachandran, since I miss him everyday. This is the best blog you've ever written. It was written so well and so descriptive that I could actually imagine how your life was with him. Wish I'd known him. *:(* I'm going to pop in one of his movies and watch it now. Thanks for writing about him, di. Great stuff. Am going to show this blog to J cuz..its the best description of Thatha i know of...didh..u making me cry at work..i miss him so much..luv't u. I esp. miss massaging his chest when he had those chest pains and he'd keep telling pattu that i was wayyyy better than her! :) I wonder what he'd think of us and our lives now...I think we'd be different people if thatha still lived. Thanks for sharing this personal portrait with us. Your thatha sounds like a very special soul. Gentle, humourous, supportive, kind... and loved by many. I'm sure you all miss him very much - thanks for keeping him alive through your writing. Thanks Gary (again) for your wonderful comment. I'm so happy to see how this piece of writing about him is being appreciated. Take care. Chanced upon this blog when trying to glean some info on your grandad. As I am typing this, Sun TV, the leading Tamil Channel in Tamil Nadu is showing his movie, "Sabapathy", IMO, among the best comedies I have seen in my life.The best part about this comedy is that it is so "young" that any youngster of today could relate to it. 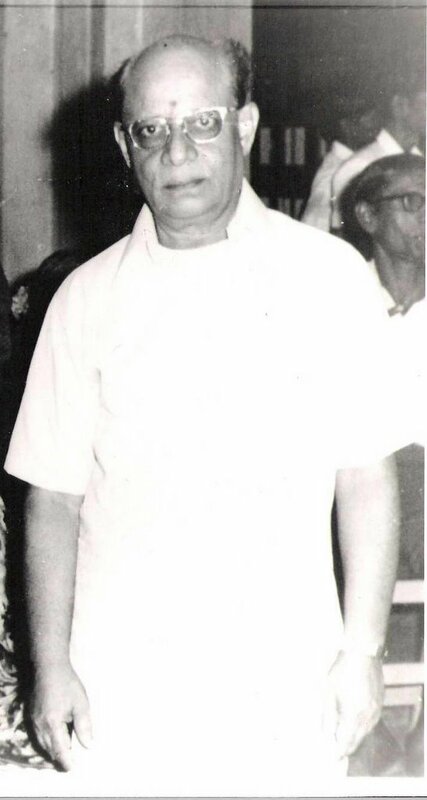 I had been looking for info about the great actor T.R.Ramachandran.and lo..I found one written by his very own grandson.I am a great fan of his innocent comedy..I loved his role in Thirumal Perumai and Thillana Mohanaambal..He has this unforgettable and expressive face which itself is quite funny just to look at...Long live his comedy! I am hoourd to post this comment in the blog of the granddaughter of the comic gem TRR. My father is a great fan of TRR and I loved every film with TRR's decent and innocent comedy in it!! Happened to visit this through google search for TRR. And a pleasant surprise = his grand daughter's writing ... made interesting reading. Nice to hear from someone so closely related. Well the other news to me is that he hails from Palakkad from where I too hail. I hope his T initial stands for his village, Tirunellayi or Thattha mangalam. If possible update. Sorry, Apologise. I think I got your name wrong. Hi, I happened here,as I[just like others]were looking for an information on him.I became his fan when my mother took us to see his Saadhu Mirandaal Movie.I was quite young then,but He caught my attention.The other movies of his that I enjoy are Adutha veettuppen with Vyjayanthi Mala and Thangavelu[I think it was remade in Hindi,too] and ofcourse sabapathy.By the Way was he a proficient Mridangist ,too.I was looking at Thillana Mohanambal video,when I noticed his playing,it is so real[does not look like acting].Even in his Villain roles he was lovable..I feel very sad to know he is no more.If ,I as a fan could feel such saddness,yours must be profound..Thanks for sharing info about him as a Grand father.It shows what a beautiful person he was inside and out. In my childhood TR took Photos of my family for his rememberence. I will be happy if I met TR's grand sons. Thanks for the wonderful post. I am just watching a special show on Jaya TV on "Adutha Veettu Pen" with TR Ramachandran. 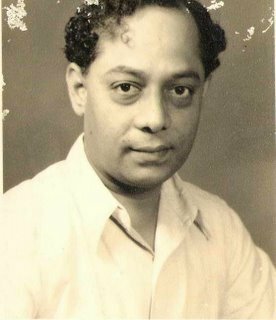 My first thing was to Google and see more about TR Ramachandran, and I landed on this wonderful blog. It is wonderful to hear there are at least a fe people you see that make you smile in movies, also make people smile in real life. Proud grand daughter..
Hullo madam! It is great to know that you are a descendant of such a great man :-) I am writing a Wikipedia article on T. R. Ramachandran which is available here (http://en.wikipedia.org/wiki/T._R._Ramachandran) and I wish to know his date, month and year of birth and other details. Sitting in my office - moments ago - i hummed a tune from Vazhkai to some guys here; most too young to remember the movie. I did it in jest, but the memory of that song took me backward to the late 60s when television was starting to make in road into homes. Every week there was a tamil movie shown in two parts. Almost all were in black and white, even to this day i clearly remember Vaijantimala and T.R.R in Vazhkai! Sabapathy was fun too and so was Sathu mirandal. In moments like this i get bitten by the sentimental bug and so started googling, and here is your blog! Its nice to know there is some continuity. In some ways. a small request perhaps a bit harsh! please remove the dark and pitch black background and article written in small bloody red fonts..it is hurting my eyes. your thathaa is a bright and cheerful person like a daylight sunshine , i love his tamil, i am born in mid 80s yet adore him, give him a daylight please (karna moksham) from this dim, dark sorrow stressful background. Excellent!!! writings. Very happy to see still the love towards our ancestors exits. I feel very proud of you, even I am young aged. You believe it not, I had seen the movie 'Sabapathi' 98 times. whenever I get time to relax, myself, my mom, my dad, my wife and my 2 year old kid watch this movie. I want to know about T.R.RAMACHANDRAN SIR'S native pls anybody can help me??? just watching adutha veettu peen on youtube. wanted to look up on t.r.r. there is so little info in the web, except this blog. awesome actor he was. i am 62 and used to enjoy his old movies when i was young. i find adutha veettu penn even better now than ever. God Bless. Good to know about this actor par excellence. He was brilliant..I have lost count of the number of times I have watched 'Aduttha Veettu PeNN'..Epic! Sabapathy, ofcourse is another all time favorite..Did he act in any movies after Thillaana Mohanambal? Thanks for putting this up and also his pictures.. I am a great fan of Mr.T.R.Ramachandran. He was a great actor and comedian of his time. My father had worked with him in the early 80's in some movies and used to praise a lot about the kind nature of this great man. It is sad that the current Tamil cinema and its audiences have forgotten such great legends. I had the fortune of living next door to your thata in Coats Road. Although years have passed I will always remember him for his wit, welcoming attitude and being a great neighbor. Probably your mother will be able to remember Babu Mami (my mother). I am a great fan and have seen many of his movies. Surprisingly not much is said, about an unforgettable movie he did with Sivaji Ganesan : 'Kalyanam Panniyum Brahmachari. I remember also 'Padikkàtha Methai, Punar Jenmam, Kathaanayaki'. He was a comedian with great intelligence. God Bless His Soul! My warm regards to you and other members of this illustrious man. One of my favorite actor in the late 50s, and early 60s, where his movies always projects that " special" funny accent in the Tamil language dialog and laughter...I still hold a collection of his movies and when time permits, view with great satisfaction. Hi Vee, nice to see the grand daughter of a legendary comedian like Mr. T.R. Ramachandran through this blog. I'd like to know more about him as I'm about write an article on him. Feel free to email me. Just last week murasu TV showed sadhu mirandal. TRR was liked not only for his big round eyes , but for his child-like accent. He used to say ' Oh I see ' in many of his movies. Thank you google, for bringing me to this blog. I and my wife have together watched many movies from the black and white era. We might sound old fashioned, but the humor, the spontaneity, and the music of those days will never come back. I have watched TR Ramachandran in several black and white movies of that era - I am sure those who have seen his movies will agree that his dialogue delivery was par excellence, and his acting skills that few could, (and can) match even today. I just realized that you are the grandson and not the grand daughter of TRR. My apologies! @Soulmate2015: I am indeed his granddaughter. You had it right the first time. Just finished watching Sabapathi for the nth time and wanted to google about T.R.R. This movie is my all time greatest. Read this even more moving blog on TRR and another on Mrs.TRR. I wish I had known that TRR lived in LA in 1990s as I would met him in person. Now I live in Toronto and glad to know that his grand daughter lives here and keeps his memories alive. I am a huge fan of Sir. T R Ramachandran. My all time favorite of his movies is sabapathy in which he potrayed a naughty character and he executed it with such a naturality that makes everyone to feel that he was naughty in real life too. i was trying to browse with his name i hardly end up getting information. thanks for the wonderful blog about him. He was a natural actor. Love him a lot! What took him to Los Angeles? Hello, very nice to see a write up about Mr. T.R.Ramachandran. As his grandchild you may not know this, but my father ran a nursing home in Madras - namely Ranga Nursing Home. Mr. T.R.R was a patient of my father and grand uncle. I was a kid when he and your grandmother used to come to the nursing home frequently. Whenever your grandfather saw me there, he used to call me "ennada Nana" (my name at home was Narayanan). I dont know why, but that rang very affectionately with me. I am sure your mom/aunts will remember Ranga Nursing Home, as I think I have seen them there as well. Please check with her. Anyway, good to hear good things about Mr. TRR. Ofcourse his best movie was "Adutha Veetu Penn". Keep in touch. Thanks. I was just watching one movie of him.. Vaalkai, I liked his role in the movie a lot.. I immediately searched for him and finally landed here in this blog.. Liked the blog a a lot .. And it's nice to hear that he's is a very good human being too in real life..
Hi...iam Sathyanarayanan from Tirukkoyilur.. my grandfather is Ranganatha Rao....His own sister son only is Mr.TR Ramachandra rao. Nice writing. I have always been TRR's admirer and think that his movie Sabhapathy is classic. Interesting to note your comment. Pls ready my post beloe at the end of this blog. I hope you are also aware of the facts. I landed here by sheer chance; and what a chance! I have always wanted know about his off screen persona. People often refer to him wrongly as a comedian. He was a character artiste with an excessive sense of humour! He was a class apart, too classy to be acceptable to a Tamil film culture that was fast deteriorating! I envy his lucky family members! His personal side has lot of good and bad as well. So pls dont envy. There are few unlucky family members as well. Sorry,din' mean to offend anybody. I had always admired him as an artiste. I seen your gradpa in sabapathy 1941 Tamil comedy movie, its interesting to see..